This post adds my own personal experiences to improving the email authentication protocols of my own domain. I wrote about these issues in general for iBoss earlier this year and described the three protocols (SPF, DKIM and DMARC) and how they interact with each other. These protocols have been around for a while, and implementing them isn’t easy and hasn’t been very popular, outside of perhaps Google-administered email domains. A recent survey from Barracuda shows how the majority of folks haven’t yet set up anything in their environments, as you can see by this graphic below. Another survey from Agari (who sells DMARC managed services, so they have something of a self-interest) says 82 percent of federal government domains lack DMARC protection. To try to fix this, the feds are getting more serious about DMARC, requiring it across all agency networks soon. So I wanted to be able to lead by example and actually put these tools in place on my own servers. That was easier said than done. I first contacted Valimail in August. They have a managed email authentication service and agreed to work with me to get me set up. Valimail knows what they are doing in this space. As an example, a few weeks ago one researcher posted how he could deliberately break some DKIM records if he created some oddball email messages. Turns out Valimail has this covered and posted a counter reply. They claimed that the researcher didn’t really understand how it was used in practice. And that is the issue: these protocols are very, very hard to implement in practice. Getting my domains setup wasn’t easy: part of that was my fault, and partly because this is a knotty area that has a lot of specific knobs to turn and places where a misplaced comma can wreck your configuration. So I am glad that I had them in my corner. Let’s talk about what was my fault first. I have two different Internet providers for my domains. First is GoDaddy, which registers my domains. I have always felt it is a good idea to separate my content from my registrar, which is where my second provider, EMWD.com, comes into play. They host my blogs and mailing lists. The problem is that the three email protocols touch on aspects of both what the registrar has to do and what the content hosting provider has to do, and so I found myself going back and forth between the two companies and their various web-based control panels to add DNS entries and make other adjustments as I needed. For your particular circumstances, that may not be necessary. Or it could be more complicated, depending on how many individual domains (and sub-domains) you own and how you have set up your email servers. When you first sign on with Valimail, they run a report that shows how messed up your email system is. Now right here I want to stop and explain what I mean. Your email system is probably working just fine, and your messages are flowing back and forth without any real issues. Except one: they aren’t using the full power of the various authentication protocols that have been developed over the years. If you don’t care about spam and phishing, then stop right here. But if you do care — and you should — then that means you need to get email authentication done correctly. That is the journey that I have been on since this summer. OK, back to my story. So I got a report from Valimail that looked like this. 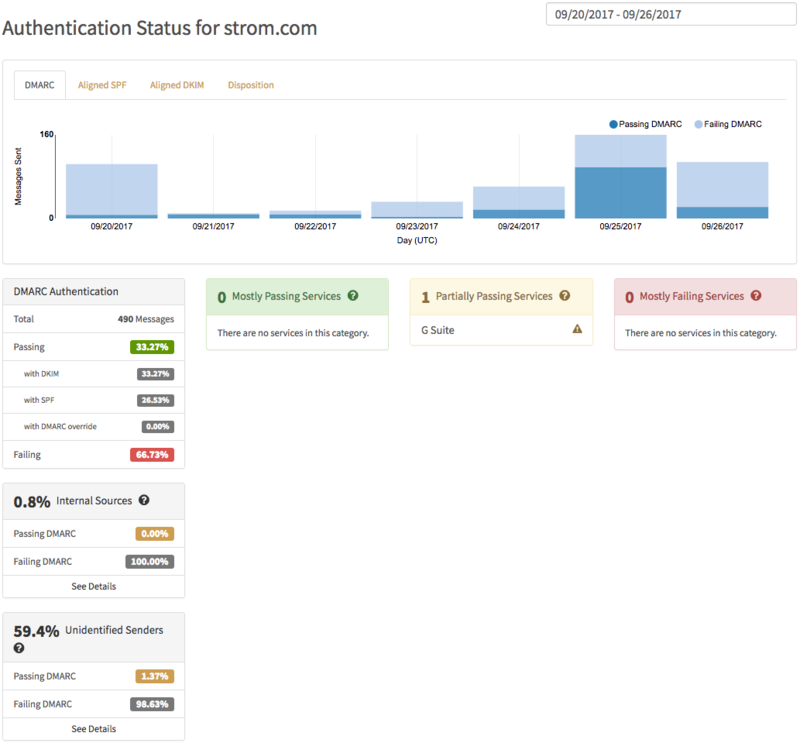 It shows that I made several mistakes in configuring my mail server because it uses a different domain (webinformant.tv) from the domain that I use for sending individual emails (strom.com). Duh! It was embarrassing, after all these years claiming to be this email “expert” (I did write a book on corporate email use once upon a time) and yet I still missed this very obvious mistake. But that is why you hire outside consultants to help you learn about this stuff. That wasn’t my only problem. Second, I was using WordPress as my blogging software. Now, what does this have to do with email, you might ask? My problem was I didn’t immediately make the connection either. Some of my emails weren’t being authenticated properly, and it was only after further investigation did I realize that the comments that were being collected by my blog were the culprits. WordPress uses email to notify me about these comments. Luckily, there is a plug-in for fixing this that was available. Of course, it still took some effort to get it working properly. This is why you want someone like Valimail to be working with you, because the chances of making any errors are huge, and your email infrastructure can be a bigger project that you realize, even for a small organization such as my own operation. I have one other technology piece in my mix. One of the reasons why I chose EMWD is because they offer cheap but really good hosting of Mailman, which is a Unix-era email server that I have been using for more than a decade for my weekly Web Informant newsletters. It isn’t as fancy as Mailchimp or some of the other more modern mailers, but I also am familiar enough with its oddities that I feel comfortable using it. 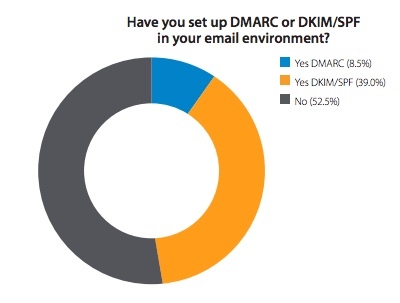 So any DKIM/DMARC/SPF installation also had to make some changes to its parameters too. Luckily, The folks at Valimail knew which ones to tweak. So it took several months of elapsed time to work with Valimail to get things correctly setup. And that is probably a good thing because uncovering all the various applications that make use of email in oddball ways will take some time, particularly if you are a decent-sized company. Most of the elapsed time for my situation was because I was busy on other matters, and also because it took me several tries to understand the scope of what I had to do. Also, because Valimail’s typical customer is a larger enterprise, they weren’t very familiar with the cPanel interface that EMWD (like a lot of smaller ISPs) employs, or working with WordPress, so they had a learning curve too. The team that helped me was very patient, which was great because I did need a lot of hand-holding (in the form of JoinMe meetings and screen sharing sessions) to walk me through the various processes. But what this demonstrated to me is how ingrained using email for various tasks can be, even for a company of one employee. So the moral of the story: even if you know what you doing, this is one area that requires very specialized knowledge. But if you want to make an effort to reduce spam and phishing, you should implement all three of these protocols. And you might end up fixing some other email issues across your enterprise along the way too. Your experience shows that the implementation curve is (too) steep for most enterprises. Our own experience with validating SPF is that many who have SPF implemented forget their eCommerce and partner sites, similar to what you had with WordPress.